For other uses, see Straw (disambiguation). Not to be confused with hay or drinking straw. It has been suggested that Strawblocks be merged into this article. (Discuss) Proposed since January 2019. 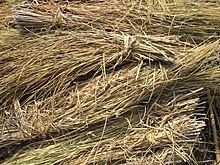 Straw is an agricultural byproduct consisting of the dry stalks of cereal plants after the grain and chaff have been removed. It makes up about half of the yield[clarification needed] of cereal crops such as barley, oats, rice, rye and wheat. It has a number of different uses, including fuel, livestock bedding and fodder, thatching and basket making. Straw is usually gathered and stored in a straw bale, which is a bale, or bundle, of straw tightly bound with twine or wire. Straw bales may be square, rectangular, or round, and can be very large, depending on the type of baler used. Straw may be fed as part of the roughage component of the diet to cattle or horses that are on a near maintenance level of energy requirement. It has a low digestible energy and nutrient content (as opposed to hay, which is much more nutritious). The heat generated when microorganisms in a herbivore's gut digest straw can be useful in maintaining body temperature in cold climates. Due to the risk of impaction and its poor nutrient profile, it should always be restricted to part of the diet. It may be fed as it is, or chopped into short lengths, known as chaff. Bee skeps and linen baskets are made from coiled and bound together continuous lengths of straw. The technique is known as lip work. The straw-filled mattress, also known as a palliasse, is still used in many parts of the world. It is commonly used as bedding for ruminants and horses. It may be used as bedding and food for small animals, but this often leads to injuries to mouth, nose and eyes as straw is quite sharp. The use of straw as a carbon-neutral energy source is increasing rapidly, especially for biobutanol. Straw or hay briquettes are a biofuel substitute to coal. Straw, processed first as briquettes, has been fed into a biogas plant in Aarhus University, Denmark, in a test to see if higher gas yields could be attained. The use of straw in large-scale biomass power plants is becoming mainstream in the EU, with several facilities already online. The straw is either used directly in the form of bales, or densified into pellets which allows for the feedstock to be transported over longer distances. Finally, torrefaction of straw with pelletisation is gaining attention, because it increases the energy density of the resource, making it possible to transport it still further. This processing step also makes storage much easier, because torrefied straw pellets are hydrophobic. Torrefied straw in the form of pellets can be directly co-fired with coal or natural gas at very high rates and make use of the processing infrastructures at existing coal and gas plants. Because the torrefied straw pellets have superior structural, chemical and combustion properties to coal, they can replace all coal and turn a coal plant into an entirely biomass-fed power station. First generation pellets are limited to a co-firing rate of 15% in modern IGCC plants. In many parts of the world, straw is used to bind clay and concrete. A mixture of clay and straw, known as cob, can be used as a building material. There are many recipes for making cob. When baled, straw has moderate insulation characteristics (about R-1.5/inch according to Oak Ridge National Lab and Forest Product Lab testing). It can be used, alone or in a post-and-beam construction, to build straw bale houses. When bales are used to build or insulate buildings, the straw bales are commonly finished with earthen plaster. The plastered walls provide some thermal mass, compressive and ductile structural strength, and acceptable fire resistance as well as thermal resistance (insulation), somewhat in excess of North American building code. Straw is an abundant agricultural waste product, and requires little energy to bale and transport for construction. For these reasons, straw bale construction is gaining popularity as part of passive solar and other renewable energy projects. Composite lumber: Wheat straw can be used as a fibrous filler combined with polymers to produce composite lumber. Enviroboard can be made from straw. Straw bales are sometimes used for sediment control at construction sites. However, bales are often ineffective in protecting water quality and are maintenance-intensive. For these reasons the U.S. Environmental Protection Agency (EPA) and various state agencies recommend use of alternative sediment control practices where possible, such as silt fences, fiber rolls and geotextiles. There are several styles of straw hats that are made of woven straw. Many thousands of women and children in England (primarily in the Luton district of Bedfordshire), and large numbers in the United States (mostly Massachusetts), were employed in plaiting straw for making hats. By the late 19th century, vast quantities of plaits were being imported to England from Canton in China, and in the United States most of the straw plait was imported. A fiber analogous to straw is obtained from the plant Carludovica palmata, and is used to make Panama hats. Traditional Japanese rain protection consisted of a straw hat and a mino cape. Straw is used in cucumber houses and for mushroom growing. In Japan, certain trees are wrapped with straw to protect them from the effects of a hard winter as well as to use them as a trap for parasite insects. It is also used in ponds to reduce algae by changing the nutrient ratios in the water. The soil under strawberries is covered with straw to protect the ripe berries from dirt, and straw is also used to cover the plants during winter to prevent the cold from killing them. Straw also makes an excellent mulch. Straw is resistant to being crushed and therefore makes a good packing material. A company in France makes a straw mat sealed in thin plastic sheets. Straw envelopes for wine bottles have become rarer, but are still to be found at some wine merchants. Wheat straw is also used in compostable food packaging such as compostable plates. Packaging made from wheat straw can be certified compostable and will biodegrade in a commercial composting environment. Straw can be pulped to make paper. Rope made from straw was used by thatchers, in the packaging industry and even in iron foundries. Koreans wear jipsin, sandals made of straw. 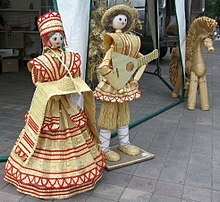 In some parts of Germany like Black Forest and Hunsrück people wear straw shoes at home or at carnival. Heavy gauge straw rope is coiled and sewn tightly together to make archery targets. This is no longer done entirely by hand, but is partially mechanised. Sometimes a paper or plastic target is set up in front of straw bales, which serve to support the target and provide a safe backdrop. Thatching uses straw, reed or similar materials to make a waterproof, lightweight roof with good insulation properties. Straw for this purpose (often wheat straw) is grown specially and harvested using a reaper-binder. Dried straw presents a fire hazard that can ignite easily if exposed to sparks or an open flame. It can also trigger allergic rhinitis in people who are hypersensitive to airborne allergens such as straw dust. In addition to its current and historic uses, straw is being investigated as a source of fine chemicals including alkaloids, flavonoids, lignins, phenols, and steroids. ^ 252507@au.dk (2017-06-30). "show". dca.au.dk. Retrieved 2017-07-02. ^ *The Straw Bale House: Suitability for the Eastern U.S.
^ California Stormwater Quality Association. Menlo Park, CA. “California Stormwater BMP Handbook: Straw Bale Barrier.” Best Management Practice (BMP) No. SE-9. January 2003. ^ U.S. Environmental Protection Agency. Washington, DC. "National Menu of Stormwater Best Management Practices: Straw or Hay Bales." June 1, 2006. Baynes, T.S. ; Smith, W.R., eds. (1887). "Straw Manufactures" . Encyclopædia Britannica. 22 (9th ed.). New York: Charles Scribner's Sons. Ripley, George; Dana, Charles A., eds. (1879). "Straw" . The American Cyclopædia. ^ Henshall, Kenneth. A History of Japan: From Stone Age to Superpower. Springer. p. 67. ISBN 9780230346628. ^ McLaren, Duncan; Bullock, Simon; Yousuf, Nusrat (2013-11-05). Tomorrow's World: Britain's Share in a Sustainable Future. Routledge. ISBN 9781134044825. ^ Schnitzer M, Monreal CM, Powell EE (2014). "Wheat straw biomass: A resource for high-value chemicals". Journal of Environmental Science and Health, Part B. 49 (1): 51–67. doi:10.1080/03601234.2013.836924. PMID 24138469. 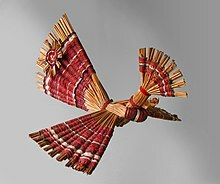 Wikimedia Commons has media related to Straw. Wikimedia Commons has media related to Straw bales. "Straw and Straw Manufactures" . Encyclopædia Britannica (11th ed.). 1911.